Hi everyone! Awhile back I posted a recipe for creamy chicken burritos. And while that one was good…well, this one is sooooo much creamier and better! You know, good to keep improving on your food right? They’re the best burritos ever. And you should know by now that I wouldn’t steer you wrong. By the way, this made two casserole dishes, so I gave one to a friend, but you can also freeze them for a later date. See the instructions for that below! In a large sauce pan, sauté chicken, onion, and peppers in butter until soft. Stir in flour until blended and then gradually stir in chicken broth. Bring sauce to a boil and cook for 2 minutes while continuing to stir mixture. Reduce heat to medium and add in cream cheese. Continue stirring sauce until cream cheese is melted. Stir in cooked rice and remove from heat. Set aside. Lightly spray a 9×13 baking dish. Spoon about ½ cup of mixture into the center of each tortilla, sprinkle with Monterrey Jack shredded cheese and roll into a burrito. Place the burrito into your greased baking dish. Continue until all of your burritos are completed. 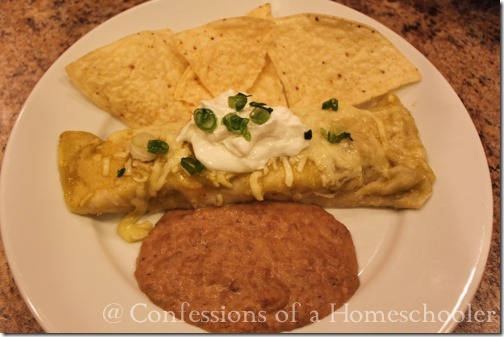 Top burritos with green chili enchilada sauce and sprinkle top with more Monterrey Jack cheese. Bake at 350° f for about 30 minutes or until cheese is melted and burritos are warmed through. Serve with homemade beans, and top with sour cream, guacamole, shredded lettuce, tomatoes, and a sprinkle of cheese for good measure. Freezer Meal Option: This is also a great freezer meal! Simply place the dish with burritos in it BEFORE adding the green chili sauce to the top. Cover dish and place in freezer up to 3 months. To serve, thaw over night in the refrigerator. 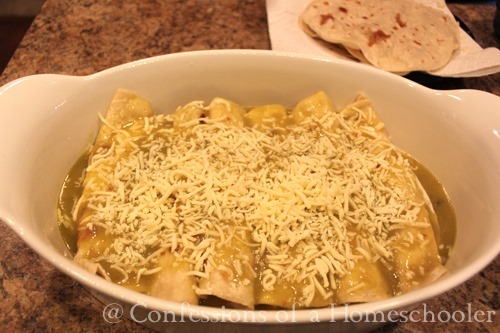 When ready to bake, top with green chili enchilada sauce and shredded Monterrey Jack cheese and bake as directed above. And that’s it, the best chicken burrito recipe ever. At least in my house. Lightly spray a 9x13 baking dish. Yummy! Trying this recipe tonight for dinner. We are not putting in the rice beacause I am the only one in my family who likes rice. This was great. I made it into a casserole by layering the ingredients. Baked it for about 10 minutes longer.Family loved it. I made this recipe last night. It was wonderful! Thank you!